Yellow fever is a disease caused by a virus that is spread to people by the bite of an infected mosquito. 90% of cases reported every year occur in sub-Saharan Africa but it is also found in tropical and subtropical areas in South America. Yellow fever is spread by the Aedes aegypti mosquito, which also carries the viruses responsible for Zika, dengue, chikungunya and Japanese Encephalitis, among other diseases. The illness ranges in severity from a self-limiting febrile illness to a severe liver disease with jaundice (hence “yellow fever”) that may cause widespread bleeding. It is potentially fatal, if left untreated, with a mortality of up to 50%. It is hard to be sure how many people are affected but the World Health Organisation estimates that there are between 84,000 – 170,000 cases per year, and up to 78,000 deaths. The number of reported cases has been decreasing over the past 10 years since the WHO launched the ‘Yellow Fever Initiative’ in 2006, with the goal of eradicating the disease. The Aedes aegypti mosquito is the primary vector, but the yellow fever virus is also transmitted by the Haemogogus mosquito. Most infections occur in or close to the jungle, where mosquitoes spread the virus primarily between monkeys. Occasionally a human will be infected. As humans are not considered to be the intended host, we are said to acquire the virus as a ‘bystander’. There are 3 types of transmission cycles. Jungle yellow fever: in tropical rainforests, yellow fever occurs in monkeys that are infected by wild mosquitoes. The infected monkeys then pass the virus to other mosquitoes that feed on them. The virus is then transmitted by mosquitoes to humans who are visiting or working in the jungle. Intermediate yellow fever: in humid or semi-humid parts of Africa, small-scale epidemics occur. Semi-domestic mosquitoes infect both monkeys and people. Increased contact between people and infected mosquitoes leads to transmission. Many separate villages in an area can suffer cases simultaneously. This is the most common type of outbreak in Africa and it can become a more severe epidemic if the infection is carried into an area populated with both domestic mosquitoes and unvaccinated people. Urban yellow fever: large epidemics occur when people, who are infected in the jungle or the savannah, introduce the virus into densely populated areas with a high number of non-immune people. Infected mosquitoes then transmit the virus from person to person. Most infected people have no symptoms at all. However, some will get mild symptoms, such as fever, chills, headache, backache, and muscle aches within 3–6 days of being bitten. Most patients improve and their symptoms disappear after 3 to 4 days. 15% of patients progress to a more severe phase of the disease within 24 hours of the initial remission. High fever returns and several body systems can be affected. The patient rapidly develops jaundice and can also suffer abdominal pain and vomiting. Bleeding can occur from the mouth, nose, eyes or intestinal tract. Once this uncontrolled bleeding happens, blood can also appear in the vomit and faeces. Deterioration in kidney function usually follows. Half of the patients who enter this severe phase of yellow fever infection die within 10 to 14 days, while the rest recover usually without significant organ damage. Yellow fever is diagnosed based on symptoms, physical findings, laboratory testing, and travel history, noting the possibility of exposure to infected mosquitoes. To confirm a suspected diagnosis of yellow fever, laboratory tests are required. Blood tests can detect yellow fever antibodies produced in response to the infection. Several other techniques can be used to identify the virus in blood specimens, or liver tissue collected after death. There is no specific treatment for yellow fever. Management is aimed at controlling the symptoms for the comfort of the patient and supportive care to treat dehydration, fever and respiratory failure. Associated bacterial infections can be treated with antibiotics. Supportive care may improve outcomes for seriously ill patients, but it is rarely available in poorer areas. Certain medications should be avoided, such as aspirin or other non-steroidal anti-inflammatory drugs (such as ibuprofen and naproxen), because these may increase the risk for bleeding. Yellow fever patients should be protected from further mosquito exposure (staying indoors and with the use of mosquito nets) for up to 5 days after the onset of fever. The mosquitoes are therefore prevented from feeding on the infected subjects, breaking the transmission cycle and reducing risk to people in the close vicinity. Those who recover from yellow fever generally have lasting immunity against subsequent infection. Yellow fever can be prevented through vaccination, bite prevention and mosquito control. The yellow fever vaccine is safe and affordable, provides effective immunity within 30 days for 99% of persons vaccinated, and a single dose provides life-long immunity. Reactions to yellow fever vaccine are generally mild and include headaches, muscle aches, and low-grade fevers. In countries where yellow fever occurs, the WHO strongly recommends routine vaccination for children older than 9 months as well as preventive mass immunisation campaigns to increase coverage across the adult population. Vaccination coverage must reach at least 80% of the population to prevent outbreaks. Use insect repellent- An EPA registered repellent is advised. 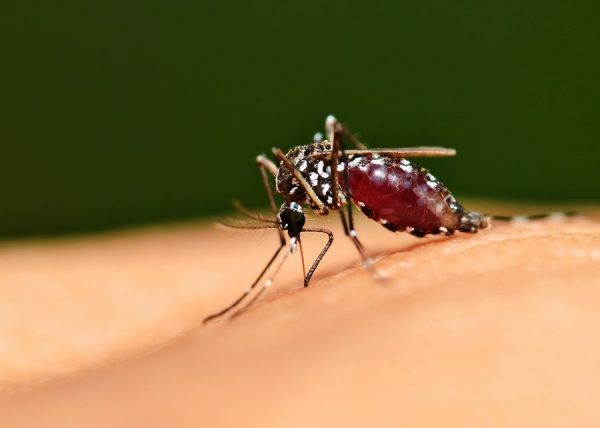 Wear proper clothing to reduce mosquito bites: wear long-sleeves, long trousers and socks when outdoors, preferably pre-treated with permethrin. Take precautions day and night – the Aedes aegypti feeds during the daytime but the anopheles mosquito responsible for malaria is active at other times. Stay in accommodation with screened or air-conditioned rooms. In some situations, mosquito control is vital until vaccination takes effect. The risk of yellow fever transmission in urban areas can be reduced by eliminating potential mosquito breeding sites and applying insecticides to water, where they develop in their earliest stages. Application of spray insecticides to kill adult mosquitoes during urban epidemics, combined with emergency vaccination campaigns, can reduce or halt yellow fever transmission, ’buying time’ for vaccinated populations to build immunity. This is practical only in urban areas. Prompt detection of yellow fever and rapid response through emergency vaccination campaigns are essential for controlling outbreaks. WHO recommends that every at-risk country have at least one national laboratory where basic yellow fever blood tests can be performed. One laboratory confirmed case of yellow fever in an unvaccinated population could be considered an outbreak, and a confirmed case in any context must be fully investigated, particularly in any area where most of the population has been vaccinated. The WHO has warned that an outbreak of yellow fever in Angola, in which hundreds have already died, could be ‘a threat to the entire world’. Cases of the virus were first reported in Angola’s capital, Luanda, in December 2015 and the disease has now spread to 16 of the country’s 18 provinces. As of late April 2016, over 2,000 cases have been reported nationally, including more than 250 deaths. It now threatens the wider region. The huge vaccination campaign, launched in February, has already reached almost 6 million of Luanda’s roughly 7.5 million inhabitants. However, the disease continues to spread and cases have been notified in Kenya and the Democratic Republic of Congo, as well as China. The global emergency stockpile of 6 million vaccines is now exhausted – a ramped-up battle against yellow fever had already strained the global supply of the vaccine. The Pasteur Institute of Dakar, in Senegal, which makes about 10 million doses of the vaccine a year, is one of only four facilities around the world producing yellow fever vaccines, joining two government-run plants in Russia and Brazil, and the French vaccine company Sanofi Pasteur. Their combined output has long fallen short of the world’s needs, and the Angola outbreak has exacerbated the shortfall. To make matters worse, the factory in Dakar is about to shut down for a 5-month renovation. Things may get better in the long run for a couple of reasons: demand for the vaccine should decline in a few years after countries wrap up their catch-up campaigns; also, the Pasteur Institute is building a new facility about 30 kilometers from Dakar, that could triple production by 2019, while Sanofi Pasteur has built a new facility in France. Spread to Asia is the nightmare scenario for yellow fever experts: Angola is already home to many Chinese workers – building roads and bridges, and working in oil fields and other industries – and at least ten cases have already been identified in China, as a result of locals returning from Angola. Five of these cases occurred in Beijing where Aedes aegypti has not been identified, making local transmission of the disease unlikely. The mosquito is abundant in southern China and elsewhere in Asia, however, which may make yellow fever an imminent threat to the region. It’s interesting to note that epidemiologists have long struggled to understand why the disease has never taken off in South East Asia. This latest outbreak has exposed how poorly prepared the world is to fight two mosquito-borne epidemics, yellow fever and the Zika virus, at the same time. Yellow fever is caused by a virus that is spread by the Aedes mosquito – this vector is also responsible for transmission of dengue, chikungunya and Zika. It occurs predominantly in sub-Saharan Africa but some cases are found in South America. It usually causes a mild self-limiting viral illness, but 15% go on to develop more severe disease, causing death in half of this group. It is diagnosed by a simple blood test. It can be prevented through a safe, affordable, effective, single-dose vaccine, in combination with bite prevention and mosquito control measures. There is no specific treatment, merely supportive management.